Equipment not stop automatic degassing device AP is fully automatic, electronically controlled air discharged to stop, purified refrigerant, to reduce the pressure of the compressed air system. AP device works very reliable and is ideal for cooling systems with a large capacity, both cooling systems with a capacity of up to 5,300 kW. 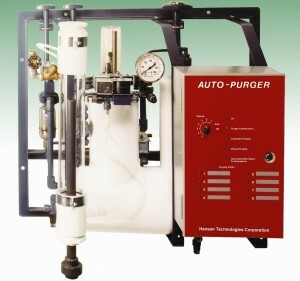 These high-end equipment such as line AP08, AP16 and AP24 was assembled, connected control system, complete insulation on include bubble tubes at a factory in the US. Requires the installation of pipelines taking gas connections do not stop, refrigeration service road, suction, power lines, water lines, drain lines and power supply lines for the solenoid valve in the discharge point. AP equipped devices to save energy, and most of the equipment investment is payback through energy savings during operation within 1 year of use.